The end of summer is closer than you think. That means your calendar should be packed with epic weekend getaways to make the most of it -- and we’re not talking about you and your buds sitting around the same old dusty lake house playing card games like you have the last five years. From annual beach parties to college reunion road trips to lazy river floats, switching up traditional summer trips to maximize the memorability factor doesn’t have to require a lot of work (or even cash). So pack the car with a projector, snag a few water guns, and stock the portable cooler because it’s time to take every kind of warm-weather adventure from ho-hum to 100. Whether it’s your first tubing getaway or an annual affair, simply lying there baking in the sun is not how you want to remember your trip down the river. Two words, people: water toys. Head to the store or investigate sites like Amazon and load up on a mix of Super Soakers, packs of squirt guns, waterproof footballs, and even flying discs to add instant competition to the otherwise lazy river. It’ll not only keep the squad entertained (and cooled off), it’ll help you meet new friends -- who’ll most likely trade you a cold drink for a go at the Super Soaker. 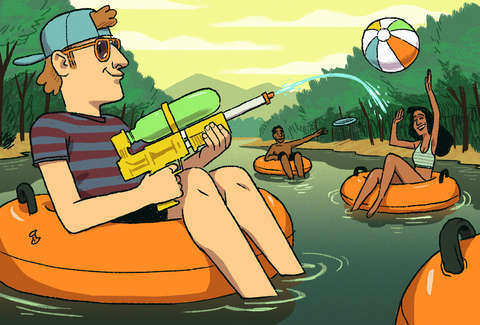 And hey, no one says you can’t fill those water guns with refreshing beverages, either. Camping should be about roughing it in nature for a few days, but that doesn’t mean lounging on tree stumps and candle-lit card games need to be the extent of your leisure activities. If this is the current state of your outdoor HQ, it’s time for an accessible design overhaul. After an exhausting day of exploring the great outdoors, R&R can be easily achieved with affordable seating that can adapt to any environment. Think packable hang-up hammocks for less than $40 and inflatable loungers perfect for around a campfire that require no air pumps. A little ambience goes a long way, too. Pick up battery-powered string lights, patterned tablecloths, and some flameless candles for a campsite that’ll make people think you’re a regular Martha Stewart. Last year’s beach weekend with the crew was unforgettable -- all thanks to cloudless weather and the well-earned “W” during sand volleyball. But you wouldn’t be able to tell swiping through the basic group photos. (Uh, everyone is sunburnt and who is that photo bomber in the back?) Upgrade both the photo opp and, more importantly, the enjoyment factor of your beach getaway by starting the party at sunrise. There are zero crowds, everyone looks fresh-faced with SPF, and there’s nothing like a mid-morning nap with rolling waves as an alarm clock. 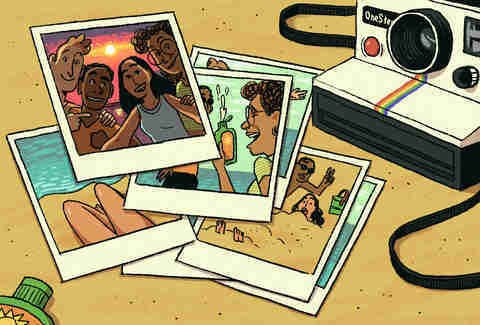 To commemorate this new tradition, bring an instant camera -- eBay and Etsy offer affordable options, like a $40 Fujifilm and a $27 Polaroid -- so everyone can leave with a physical keepsake. Don’t forget a permanent marker to write quotes and inside jokes on each photo that sum up this unforgettable wake-up call. There’s nothing wrong with becoming a regular at your local sports venue -- until every vendor can recite your food and drink order by heart. Whether it’s a baseball series, tennis match, or pre-season football, mix up summer game night by grabbing your jersey and following your beloved hometown team to a nearby city. It will turn the usual hours-long outing into a 48-hour trip, and the spontaneous adventure doesn’t have to require major funds, either. Save dough on same-day tickets without sacrificing any amount of fun by cheering from the outfield or bleachers. Everyone knows some of the most die-hard fans sit in these areas, plus, you’ll have more money for a nicer hotel or exploring the sights, tastes, and sounds of a new city before and after every game -- even if you are rooting for the other team. If this is the fourth lake house reunion in a row where everyone has battled it out over late-night charades or fallen asleep watching the same Netflix shows they binge back at home, it’s time to switch up the nightly entertainment with a movie under the stars. Bring (or rent!) a projector and screen to make a backyard film come to life. Utilize what’s already at the lake house to create the full effect, too: Situate lawn chairs to mimic theater seating, add cushions and throw blankets for added comfort, and you’ve got yourself a proper summer movie night. Don’t forget about food or libations, either. Create a big batch of self-serve punch for everyone to enjoy (like this refreshing pomegranate tequila recipe) and serve popcorn that’s made by popping kernels over the fire. If no one can decide on the movie, then whoever wins at charades gets the deciding vote. The whole point of riding ’coasters as an adult is to release the inner kid that never left. This doesn’t mean you have to eat like one. 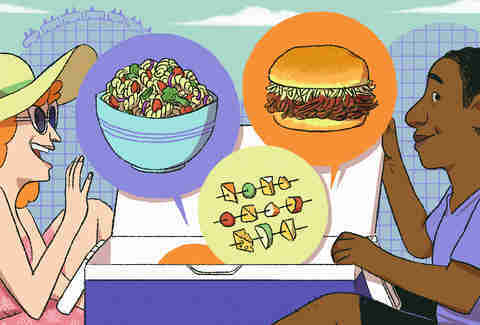 Avoid simple, likely deep-fried, and overly expensive amusement park fare by bringing gourmet lunches from home (just make sure to check the outside food and drink restrictions first). Armed with a compact cooler, like this $20 insulated lunch bag or a temperature-controlled tote bag, any kind of picnic in the park is possible. Opt for dishes that taste even better cold, like pasta salad with seasonal veggies or barbecue pulled pork for sandwiches. When it comes to snack time, upgrade standard cheese and crackers to skewers that alternate fruit, cheese cubes, and herbs; or even prosciutto and melon. Don’t forget to prep a seasoning kit with salt, pepper, olive oil, and even lemon wedges so you can up the flavor on the go. If it’s your crew’s M.O. to catch up on a few Zzzs in the backseat during a road trip, everyone is missing out on all the hilarious stories you could be telling on the journey. Keep the whole car entertained -- driver included -- by game-ifying the trip. Hours on the road will fly by with group challenges, like vying to spot the most out-of-state license plate (winner gets a cup of coffee or candy of choice at the next gas station), revealing weird college secrets with lifelong buddies during “Never Have I Ever,” or engaging in DJ battles where everyone takes turns playing the ’90s pop song they think the driver wants to hear. You can even make pit stops, especially drive-through runs, more memorable by having everyone order the weirdest local speciality on the menu. Winner gets control of the aux cord (and bragging rights until next year’s road trip).